Home / Why Do You Need An Air Purifier? Why do you need an air purifier? According to the U.S. Environmental Protection Agency (EPA), indoor air pollution is listed as one of the top 5 health concerns for all of North America and Canada. As many people spend 90% or more of their time indoors, they encounter a variety of pollutants. Addressing these concerns is very important. With 750,000 new asthma cases each year the challenges with air quality are getting worse, not better. Also, as homes are built tighter to retain the energy required to more efficiently heat and cool them, we are holding these pollutants inside the home. Fortunately, there are products that can help clean your air and make it healthier and safer for you to breath. Follow along for more information about the Elite Air Purifier. With the Elite Pure Air Purifier, people affected seasonal allergies will find relief with an improved quality of breathable air that holds fewer allergens, germs, and other forms of bacteria. Pet owners find allergy relief because the Elite Pure Air Purifier removes pet dander and unwanted odors from the air. The Vacuum Authority developed the Elite Air Purifier to be able to provide customers with a superior machine at an affordable price point. 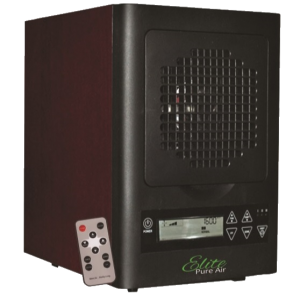 The Elite Air Purifier features a UV Bulb that sanitizes the air that you breathe. Enjoy free assembly when you buy an Elite Air Purifier at a Vacuum Authority store. Get the peace of mind with real warranty protection. We offer a 30-day money back guarantee if you are not completely satisfied with this machine. Eighty-seven percent of American homeowners are not aware that pollution may be worse inside their homes than outdoors. Indoor air pollution is two to five times greater than the air outdoors (sometimes 100 times greater). Air pollution contributes to lung disease, respiratory tract infections, asthma, and lung cancer. Now that you know the facts what do we recommend? The Elite Air Purifier sold exclusively at the Vacuum Authority. It has 6 different methods of cleaning the air. There is a HEPA filter (washable), Charcoal or Carbon Filter for odors, Pre-Filter for large debris, TIO2 which is Titanium Oxide Filter for VOC’s, and a UVC Bulb for sterilizing air born mold, viruses, and so much more. Try it risk-free for yourself.